Make a donation to Demos! Your gift helps to create an America where we all have an equal say in our democracy and an equal chance in our economy. Our work to reduce political, economic, and racial inequality through original research, advocacy, litigation, and strategic communications is only possible with your support. Thank you for partnering with us. Please make your donation below today. GREAT idea! Whoever thought of it deserves an award! I've had no trouble with credit reports but I can imagine the problems others have had even though they have tried to do everything "right." I want to give a gift of stock. What is Demos' EIN number? Demos' EIN (Employee Identification Number), a specific number given to us by the IRS, can be used to make gifts of stock. Our EIN is: 13-4105066. How do I get the official Demos Bottle? We invite you to become a monthly donor to the Demos Sustainer Fund, which allows you to spread your support over time and provides Dēmos with a dependable base for our day-to-day operations. 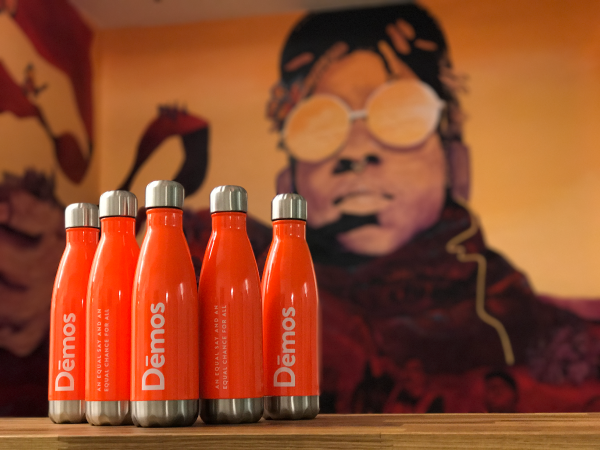 *As a special appreciation, anyone who makes a monthly contribution of $31 (approximately $1 per day) or more receives an official Dēmos Bottle, perfect for your hot or cold beverages, while you’re out demonstrating or enjoying moments of self-care. Thank you. #SustainDemos.